EVERYTHING built in LA is defined by parking, whether we like it or not. More specifically, everything is defined by our parking code. Los Angeles, unlike, say, New York, has extremely strict parking code for all residential occupancies. For all buildings in an R4 zone (AKA condos and rental units with more than 3 units) each unit is required to have 1 full size dedicated parking space. Compact spaces are not allowed, nor tandem spaces. In making our assessments as to required space for parking, the typical calculation is that each full parking stall will require 375sf of space (after considering not just the space itself but also the required drive aisle, egress, out of the structure, etc. So that 800sf apartment is actually 1175 sf to build. But wait, there’s more! That parking space for each unit either has to be at ground level (which is the most valuable real estate on the whole project), or it has to be above or below ground. Going underground is astronomically expensive, primarily due to removing all that dirt, and the fact that earthquake zones such as LA have expensive requirements for structure below grade. Even going up above grade is problematic, given that the required dead load of vechile parking makes for expensive structure. So not only is 32% of your apartment just for your car and otherwise useless, but its also by far the most expensive part of that apartment to build. Now we have to consider the required open space. Unlike most major urban cities such as New York or Chicago, Los Angeles has a requirement for each unit to have at minimum 100sf of planted open space on site. At least 50% of that open space must be “common open space”. What that means in real terms is that you are required, by code, to have a rooftop or podium garden on your building. As a developer you want as many balconies as possible, since you can charge more for a balcony and typically not so much for a nice communal garden / roofdeck. But even if you give every single unit a balcony, you STILL are required to have that stupid garden to a size of 50sf per unit. At least 25% of that garden must be planted with heavy plants / planter boxes that jack up your dead load and thus jack up the cost of the building’s structure. So now that 800sf apartment you are building is actually a 1275sf apartment, with a garden and a large parking space. Can we take at 800sf and divide it into smaller rooms? So a low income family could live there? No we can’t. The required parking and open space are defined by the “number of habitable rooms” in the unit. Take that 1 bed room unit and make it a 3 bed room unit and now you have a requirement of 1.25 parking spaces (which rounds up) and 175sf of open space instead of just 100sf. What if my apartment is right next to the metro? Do I still need all that parking? In January 2013, LA enacted its first major parking reduction, essentially giving developers the option of replacing up to 15% of their required residential parking with bike parking if they are within 1500ft of a major light rail or metro station. However, these bike spaces must be “long term” spaces, which require locked cages, a dedicated bike servicing area. Also, each removed parking stall requires 4 bike spaces and all spaces must be at ground level, the most valuable real estate on the project. All this means that the trade is barely less costly than the parking spaces it replaces. Another thing to consider with building near the metro is something called “street dedication”. A street dedication is the area between the existing street and the area on a building site that you are allowed to build on. Essentially its space the city is reserving for future expanding of the streets (for wider sidewalks, more lanes, etc. Because the city expects more traffic near these new metro stations, they have altered their plans to have much larger street dedications near the metro stations, squeezing the neighboring lots and raising the cost per square foot of each of these lots. Understandable, but it does not help the issue at hand. OK, fine. So how affordable can I make my new rentals / condos?? All developers consider this as a cost per square foot (CSF). While all the parking and open space requirements make the CSF grow, lets just assume that its all the same. A modest, relatively affordable development might be $130 per sellable square foot to build and sold at $165 (these numbers are VERY oversimplified). If we built our tower in New York code, our cost to build would be $15,600,000. The same tower in Los Angeles would be $24,862,500 after the premium for shakeproofing and higher dead loading. Now we price both buildings at $165 per square foot, and sell all units. We get 19,800,000. That New York building makes us 4.2million. The Los Angeles building? You LOSE over 5 million dollars. This is why you will never again see a new skyscraper in Los Angeles with condos selling for the lower middle class. They literally can’t build a legal building to code and charge acceptably without destroying their own business. Just to break even, our developer for this project would need to charge $207 per square foot. Now consider the cost of land (all time high), cost of tower capable contractors in Los Angeles (at an all time high due to demand), as well as marketing, and paying your employees, architects, surveyors, required consultants over the course of multiple years. $300 per foot would be little more than break even. What if something goes wrong? A delay? What do you pay yourself and your investors? TLDR: Los Angeles, right now, is simply incapable of building affordable rental and condo towers. The only way to make a new highrise building cost effective is to make luxury units, because what would be luxury amenities in New York or Chicago are required in Los Angeles by the building code, not optional. That was OK back when LA had cheap land and cheap construction, but our land and labor costs have caught up to other cities. To convert things back from American units to New Zealand units: the example is for a 74m2 apartment with 35m2 of parking and a 9m2 garden area. This is pretty similar to many new two-bedroom apartments on the city fringe. A break-even price of US$300 per square foot equates to around NZ$4500 per m2 – which would mean a break-even price of around $530,000 for the apartment. That would be a great price for a new apartment in Auckland – reflecting the fact that construction costs are considerably higher here than in Los Angeles. Virtual NIMBYs. What a world. On a completely different note, an article by Andrea James in Boing Boing has finally answered one of my small nagging questions about Auckland. Namely, why does this exist? Who put it on an otherwise nondescript utility box on Mt Eden Road, and why? 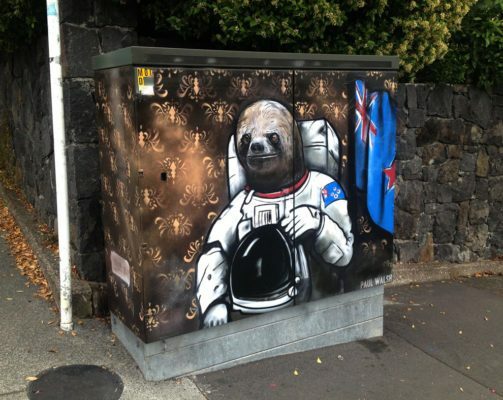 Artist Paul Walsh brightens up the streets of Auckland, New Zealand by sprucing up old utility boxes with delightful creatures. It all started after he painted Grumpy Cat on a utility box. Chorus – the company that operates NZ’s phone network – got in touch with me via the newspaper, and asked if I’d like to paint some of their DSL Cabinets – big green boxes that sit on hundreds of suburban streets across the country. They couldn’t pay me, though (or else they’d have to sign off the artworks, and it would get complicated and boring). So I turned to the public for funding. And.. wow! The public are awesome. I ran a campaign on Pledgeme asking for $350, and got a total of $1300! So now I am able to take time off my day job and go paint some cool things around Auckland. Onya. Paul’s changing Auckland for the better. To close out, a couple of things on transport. First, carpool lanes. When bus lanes or T3 lanes are working as intended, they will look pretty empty compared with adjacent traffic lanes. Instead of having a queue of cars moving sluggishly along, they will have a vehicle whiz by every few seconds or few minutes. Jakarta’s high-occupancy vehicle (HOV) policy was one of the strictest in the world: the main streets in the CBD required three people per car during the morning and evening peak times. Driving at all on these roads without passengers risked a fine. So, when Jakarta suddenly announced that the policy was entering its last week of life, economists Rema Hanna, Gabriel Kreindler, and Benjamin Olken hopped to it. Two days after the announcement, they started collecting anonymized Google Maps data on driving speed from several main roads in the city. This gave them data from the last few days of the HOV policy, which they compared to data collected after the policy ended. “The data from before the policy was lifted reveal that traffic was clearly bad,” write Hanna and her colleagues. It was taking between 2.2 and 3.2 minutes to drive a kilometer on three of the main roads (that’s about 11 to 17 miles per hour), and it was as bad as 4.4 minutes per kilometer at some points. For comparison, cyclists in Copenhagen average about 3.5 min/km. Congestion before the policy ended was bad enough that these drivers were going slower than the average casual urban cyclist could. The data from the few days before the policy lifted already held some clues that the HOV rule was doing something, however. On non-HOV roads, peak times were horrendous, but things got better off-peak. On the HOV roads, the peak times were actually slightly better than off-peak times. Whoops. Turns out making transport policy based on reckons leads to bad outcomes. This spring I had a “friends and family” hookup on a European electric bike, designed explicitly for commuting. It came with all the stuff—lights, fenders, a rack for your panniers, there’s even a bell bolted to the handlebars. It’s got skinner tires than my cruiser and a control panel that tells me that I hit 30 miles an hour on that one long downhill stretch past the Luna Park, the kitschy diner with the sweetheart tattooed waitresses. That’s the bike I was riding when, dressed in a skirt and blue suede shoes, I passed the roadie in black Lycra. I have been that guy. Kind of. I didn’t own a car. I rode a bike everywhere—I’m not exaggerating, I do mean everywhere, and sometimes, on the weekends, I would chew up 50 miles of road just because the weather was nice. I was always in cleats and bike shorts, my body fat was practically nonexistent, I ate like a teenage boy; it was awesome. And then I crossed age 35, and then 40, and then this is a story you don’t need me to tell you. I began working primarily at home, and I moved to the top of a stupid hill. So there I was at home, eating snacks and not going anywhere and generally becoming spongy and middle-aged and honestly, kind of lazy. I admit it. I tried for a while to ride. I’d bust out my sturdy old commuter, the same bike I’d logged 100 plus miles a week on. I’d ride into downtown Seattle for work, and then, on the ride home, I’d quit at a place where I could load my bike onto the bus for the last brutal uphill grade. The bike racks are great—I’m glad they exist—though they’re a hassle for a short person with weak upper body strength. Sometimes, they’d be full and I’d have to wait for the next bus, and then the next. I gave up. It wasn’t fun. Riding a bike should be fun. Everything changed when I shifted to an electric bike. If you haven’t ridden an e-bike, you might think it’s a scooter masquerading as a bike. There are models that work that way, but they also have a mode called “pedal assist.” Maybe you remember learning to ride as a kid. Some patient adult ran along with you, holding you upright. They pushed you off and you felt the momentum behind you as you launched into the world of feeling the freedom that is riding a bike. That’s how riding an electric bike feels—only it’s the bike’s motor that gives you the momentum, the whoosh feeling of moving forward, gravity on your side. Electricity made riding my bike all about that freedom again, and not all about fitness. Interesting read. Problem is that its demanding thinking about and after the Nation’s Interview with Winston yesterday my brain is still trying to assimilate what the impact on auckland transport will be if he does indeed become king maker. He aggressivly stated that the Kiwirail board will be sacked, clearly he is not impressed with the direction KR is taking. He emphasised the sorting out of a decent rail connection between Northland and Auckland and although a comment was made this could cost billions he was not phased by this. Could it be double tracking, electrification, passenger services? In addition to seeing incentives to get freight moving? Will this mean avondale Southdown freight link installed. Or could he be thinking of NS commuter rail and extendind a new line northwards? My guess is Winston will take the baubles and be Foreign Minister again (as per the UK a good safe place to put a trouble maker). If instead Winston wants to leave a legacy of a world class commuter and freight line Auckland to Northland then things get interesting. I suspect the costs of building a good quality line will not add up using NZ’s usual return on investment criteria but it depends on what figures you feed in so a new government could fudge it. The costs of building a good quality road do not add up for many RoNS, yet we still build them. The KiwiRail Board’s remit is defined by the Statement of Corporate Intent agreed annually with the Government. The focus of the current SCI for 2017 -2019 (http://www.kiwirail.co.nz/uploads/Publications/KR%20SCI%202017-2019.pdf) is primarily around improving operational, safety and financial performance, apart from a vague statement to collaborate with MOT and NZTA on integrated land transport initiatives. Therefore I don’t think that you can really blame the KiwiRail Board for not prioritising long term planning, when it’s shareholder does not appear to think this is required. Clearly our auckland construction cost is way more expensive compared to overseas. We got the same issue. Developer are not making profit for building affordable apartments. Thats why you see all new apartments are luxury apartments. Apartments living is a premium considering the cost per metre vs house. Some politicians and planners in Auckland feel it is reasonable for people to pay $600k for an one-bedroom apartment that cost only $250k 10 years ago. New apartments are required to include many things that I myself, as an apartment dweller for 10 years in NZ, Australia, and Europe, consider to be optional extras, such as balconies etc. It never used to be this way: We have made regulatory decisions that effectively double the cost of building apartments in our fair city. At the same time as we talk about wanting a compact city., while requiring every apartment to be a mini Mar-a-Lago. Life is easier if you pretend there are no low-income households. Good comment Stu. What I would like to know is how expensive are missing middle developments -townhouses, row houses, duplexes, euro-blocks….. in Auckland. This should be cheaper per sq to build than apartments (which should be cheaper than they are) but are they? Can you tell us what tweaks would be most effective to reduce the price? Sailor Boy there are a few rules that are unhelpful but the 6m outlook space rule is the worst. If it was 4m, we would be able to get 5-6 townhouses on 700 sq m sections rather than 4. That brings the land cost per dwelling down. Cheers Matt, sounds like you also feel that the balcony regulation is a big constraint too? I agree about balconies. Far more important is sunshine, and the balconies usually block the sun for the level below. Also, an outdoor garden – a small, close park would do, and a communal washing line. Stu I have been battling against excessive council urban design requirements since about 2007. You can have both types of apartment builds for both the affordable end with out all of the bells and whistles and those who want premium apartments. There is alot on affordable apartments plans and concepts out there where property developers can use and make a good return investment but you said it comes down developers greed, as they can see a captive market demand. Anyone read this? IMHO, Chris Meale comes out of it sounding like a flippant idiot with no real idea about the needs of PT projects. Meales ‘s comments were indeed worrying. Especially his comments on the K Rd entrances for the CRL. “Beresford won’t ever be needed. We’ve done the modelling”. “…Meale talked at length about all this. “Future proofing”, he said, was a watchword. With leadership like that, I will sleep safer in my bed tonight. Although Chris could have explained it better, the grades on the CRL effectively preclude the station platforms from being lengthened., as to do this would mean steepening the grades between the stations to an unacceptable level. Therefore 6 car trains are the maximum that will run on the network, at least through the CRL. The grades only preclude 9 car sets if we want level platforms. Exactly. Three stations on Wellington’s Johnsonville Line are at 1in40 and this works OK. Even better if in a tunnel where slippery rail-conditions will not be a problem. Or even allow change-of-gradient along the length of the platform, such that only the front and rear carriages are on the steepened grade. Given the lengthy “vertical curves” required (i.e. gradual change-in gradient), this would probably only mean a few centimetres of additional inclination over the length of a carriage. All perfectly possible and acceptable if the designers don’t lock themselves into a “can’t do” mindset. c) sufficient clout, to make sure the project does not get bogged down with restrictive agendas? I worry that the opportunity for fools to mess this up are large. The housing crisis in Fighting Fantasty bemuses me. In Minecraft, my street of 11 year old boys were pooling resources to be able to pay for one of them to gain “shopkeeper” rank, and to be able to run a shop. Which is good cooperation. However, their biggest source of funds seemed to be the payment you get if you vote for that version of Minecraft as your favourite. Paid for voting? Is f the Fighting Fantasy game raising awareness of housing issues or a chance to hone skills in how to win in the housing market. Is the MInecraft game raising awareness of corruption or a chance to learn how to play the system? Or is it all a trivial game? The “electric bikes are/are not cheating” debate is interesting. I ride everywhere and recently got my first electric. They are transformative. You really feel like you can go forever which you can so long as you’ve charged up. But it is a lot less effort. And one of the big benefits of cycling is that you need to make an effort, that’s why it contributes so much on the health side. What I’ve not seen in the “cheating” debate is how much of that health benefit is lost by using an electric. I guess it’ll take years of epidemiological research to figure that out, but it is worth keeping in mind. It is possible that electrics induce enough extra cycling that the lack of heavy exertion on the part of a few people is offset by the much larger numbers exerting themselves at all. Well the few that are capable of the heavy exertion are free to continue. No one is forcing them to ride an electric bike. Or approaching it the other way, should we ban ebikes to force those capable but too lazy to keep up with the heavy exertion? It’d be like banning lifts in buildings less then six stories high. People should take the stairs to save society the health costs. For most people it isn’t a choice between 10km per day on an ebike or 10km per day on a regular bike. The choice for most people is 10km on an ebike or 10km in a car.